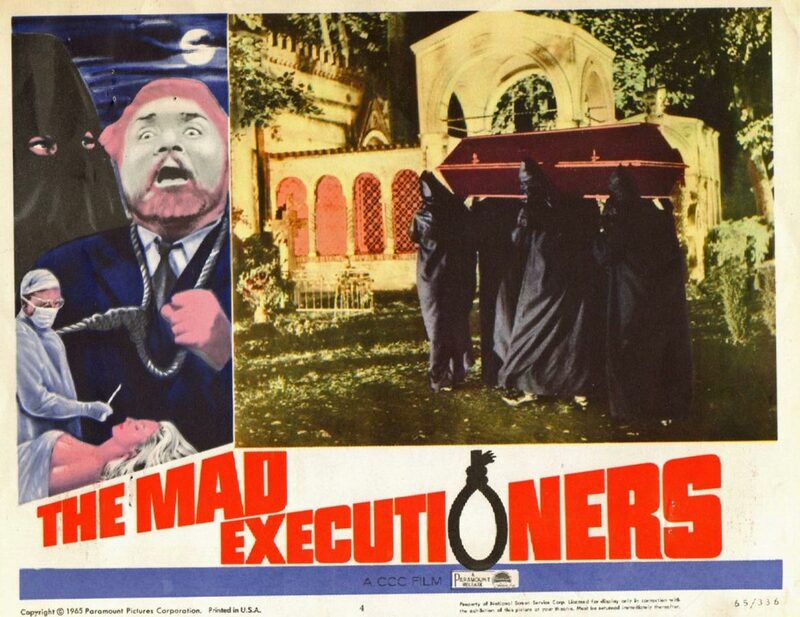 My initial interest in Edwin Zbonek’s 1963 film The Mad Executioners was because I’m a wrestling fan. Yes, I knew it was a fun horror film penned by Bryan Edgar Wallace. Yes, I knew that his dad, Edgar Wallace, was much more famous than he was, and had died tragically early, leaving behind a legendary amount of literature but not a lot of cash for his family. However, the first thing that came to my mind when I heard the film’s title was the mid-70s wrestling tag-team managed by Captain Lou Albano, made up of “Big” John Studd and Killer Kowalski. 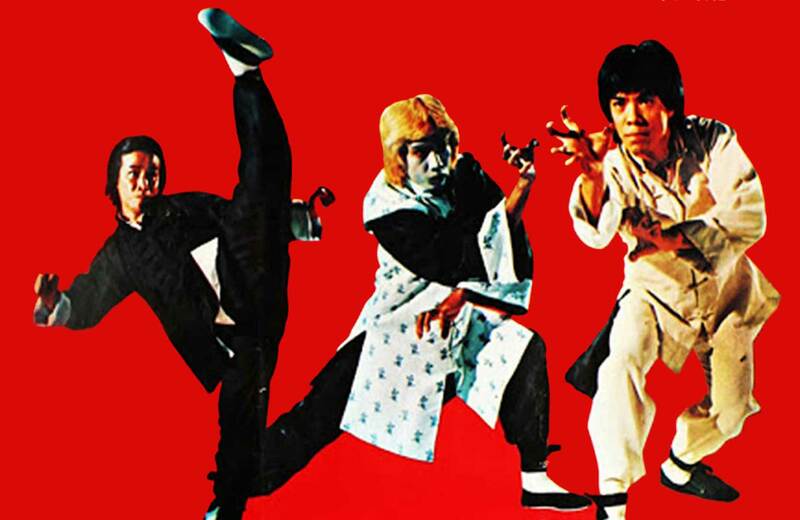 They were also called the Mad Executioners. I thought about the masks they wore, the dramas that would unfold around their characters and the legacy they left for future wrestlers who, to this day, invoke similar tropes of assassination and “justice.” I couldn’t help it. Once a fangirl, always a fangirl. 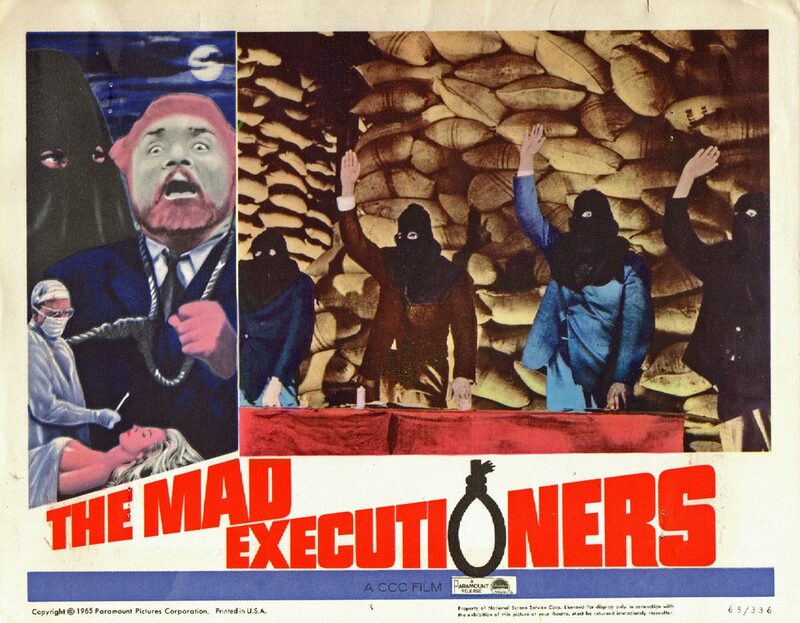 The Mad Executioners may not be a wrestling film but it handles the same themes wrestling does: society, ethics, moral values and issues of authority. In examining the film’s gory details, it’s a wild, outrageous work that has been called everything from cult-ish to elegant. Its reliance on the pulp sensibilities of the Wallace DNA allow the most insane characters and plot devices to come in at the most inopportune moments. That is what makes the film so delicious. Much like wrestling, you just have to check your “Oh c’mon dude, that could never happen” at the door because the film itself is so thoroughly fantastic. 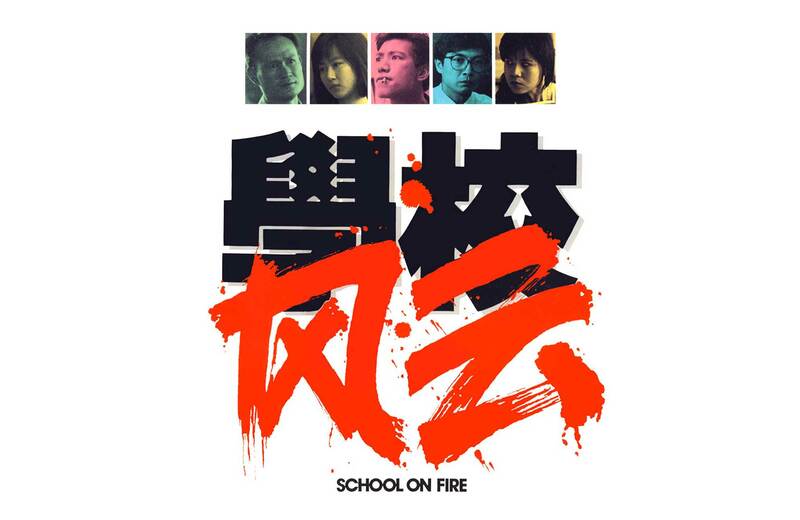 The things that happen in this film are somewhere between crime story, science fiction and whaaaaaat? The opening credits and first scene are distinctly unique. Visual and jaw-droppingly graphic, they are thrilling and inviting especially for a fan of horror films. Were they able to go that extra mile because it was the 1960s? Perhaps. Was it was because it was shot in Germany (although the setting is London)? Maybe. Is it because Austrian director Edwin Zbonek made specific notes on the screenplay stating, “In an initial contact with the author [Robert A. Stemmle], we have agreed to move the effects one step further in the production of this film than it would otherwise be in such productions…we would like to find the style of a Grand Guignol with all Gruseleffekten [horror effects]…” ? Probably. Perhaps all of the above. Whatever the reason, this credit sequence must be seen to be believed. It’s brilliantly gruesome. And I LOVE gruesome. When the film was released, there was some controversy and legal battles about whether the film was an Edgar Wallace film or a Bryan Edgar Wallace film. Reality: The Mad Executioners was adapted from a book called The White Carpet written by Bryan Edgar Wallace, Edgar Wallace’s son. Dad had died a long time ago. Film Politics Reality: death has never stopped anyone from trying to cash in on someone’s name. Edgar Wallace was an incredibly well known writer (and not just because of King Kong). Unfortunately, Artur didn’t count on Rialto Pictures who had been distributing Edgar Wallace’s work for some time. Rialto came around and said, “Uh, hold on there. We know that title and it’s most certainly Edgar. That’s from Wallace the Younger! You’d better change all the posters and all the press materials. 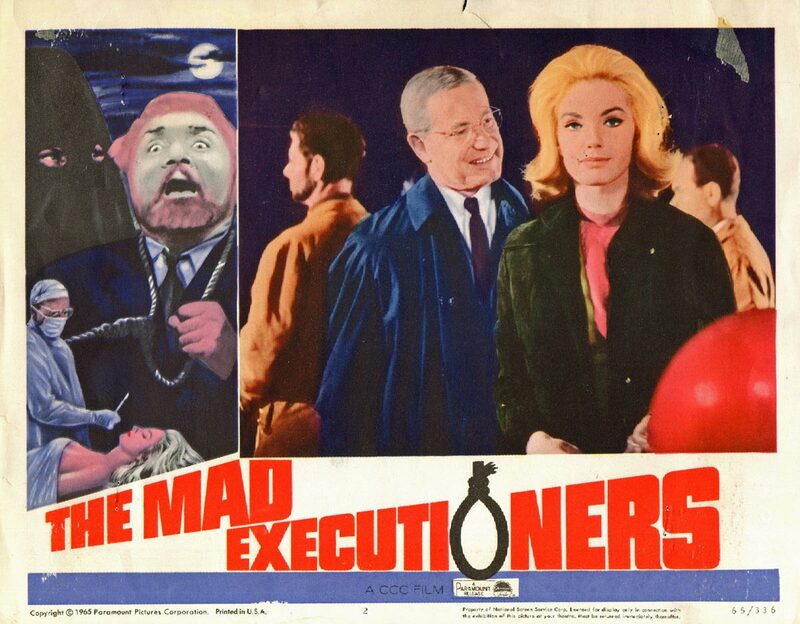 You can’t sell The Mad Executioners as an Edgar Wallace film, it’s a Bryan Edgar Wallace film!” So Artur Brauner was forced to add Bryan’s name to all the Executioners materials and sell the film through its own (real) authorship. Better deal for Bryan, probably disappointing for Mr. Brauner. The plot of the film centers on a kangaroo court dressed in executioner’s gear performing fatal justice upon those who have seen fit to commit wrong doings. To an extent, this is a pretty hard sell for the officers assigned to the case. I mean, who wants to try to find the guys who are kinda doing your job for you, right? But they have to, since straight up murder is still illegal, especially continual ritualized murder by hanging. The police force has a collection of ethical serial killers on their hands! One of the more fascinating aspects about this unique film is that it questions authority and the ability of authority figures to properly do their job. The fact that an outside force has constructed an unauthorized tribunal means that either the established jurisdiction is failing or they were never successful in the first place. These Executioners have had to take justice into their own hands because local administrative forces are a joke. This is certainly an aspect of the film that should make us think a little bit. Are we really that upset to see horrible people who have done horrible things punished for their crimes? We are and we aren’t. The excellent performances of the men who go up against the court make them appear as men do when facing certain death: fragile and fearful. Each man (with one notable exception) questioned by the Executioners has committed heinous crimes and does seem to regret what they have done and realize the enormity of the fallout. Here we have another vital question: once you have permanently damaged another person or shattered people’s lives, are you, the criminal, beyond salvation? The Mad Executioners say yes. These men who engaged in criminal activities for personal gain, unconcerned for those in their immediate path, are not worthy of forgiveness or the benefit of being tried in an “official” courtroom setting. Thus…out comes the noose. If these criminals saw themselves outside the law, thus so could their black-hooded arbiters. While black gloves and J&B scotch may not make an appearance, this is a film that fans of Giallo will love. There is a certain feel to the film and its approach to detective work that is very similar to that found within the Italian suspense/thriller genre. In fact, Bryan Edgar Wallace went on to have several giallo career highlights. While uncredited, it is documented that Wallace assisted Dario Argento with his screenplay for the 1971 giallo, The Cat o’ Nine Tails. Armando Crispino’s 1972 giallo, The Dead Are Alive, was entirely based upon a Bryan Edgar Wallace short story. Some materials for Argento’s 1970 film The Bird With the Crystal Plumage were incorrectly attributed to Bryan – Plumage was based upon an early pulp by Fredric Brown, called “The Screaming Mimi.” The association of Bryan Edgar Wallace’s name to Plumage only confirms his intergenre recognition. And truly, the krimi films were just an early and more Teutonic form of gialli. 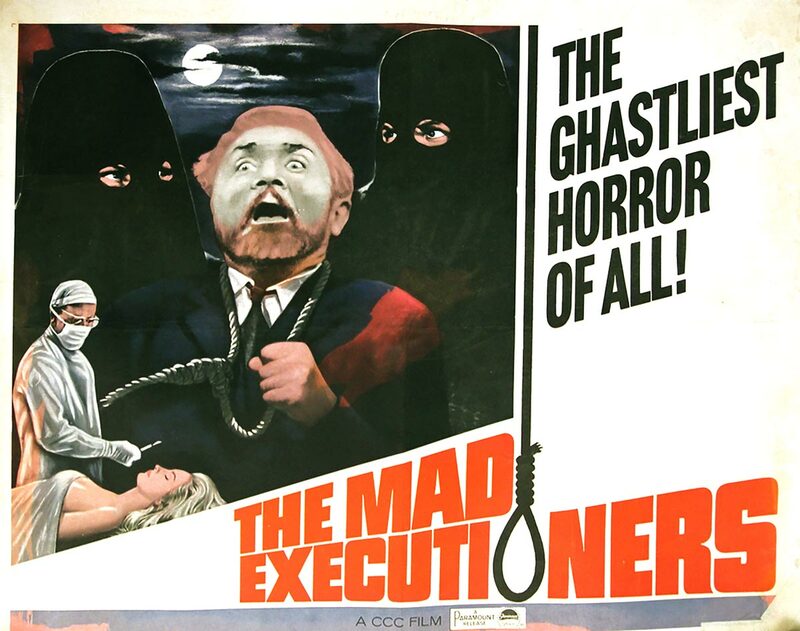 Whatever your curiosity may be in The Mad Executioners – a wrestling tag team reminder, a fun horror flick, a bizarre krimi, or a giallo precursor- you’ll be happy to have seen this on the big screen in 35mm at the New Beverly. Welcome to a wonderfully spooky October!